Why a weekend in Besançon? Or where is Besançon – as a few friends asked when I said I was visiting. Well, one of the reasons I wanted to visit the city of Besançon was because Raymond Blanc was born there. I’ve followed and enjoyed Raymond Blanc for years as one of the top chefs in England. I love his books and his cooking styles. I really enjoyed The Hungry Frenchman TV series, which is where I learned of his birthplace in the Franche Comté region of France. My overwhelming impression of this city was the friendliness of everyone we encountered. From shop staff, waiters and people in the street to our tour guide. The city was clean and well looked after. It is clear there has been rejuvenation and renovation around the city and it’s main attractions. The walking and cycle paths and tourist signs are clear and easy to follow. Besançon is a fortified city with a grand cathedral and a long history and played an important role in the Gallo Roman era. The sprawling Citadelle, which is a UNESCO World Heritage Site since 2008, is perched on a hill. It is 600 mètres long and runs around the outside of the old city. The main old city area is encircled in the shape of a horseshoe by the River Doubs which is a tributary of the River Saône. Besançon is the capital of the Doubs Department in the Franche Comté region and is known as the greenest city in France. 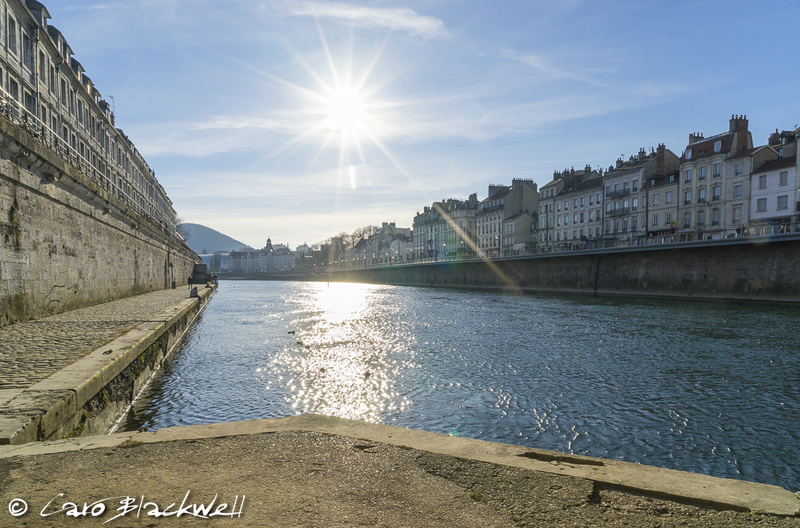 So on a Friday evening we drove 2 ½ hours from the Haute Savoie to Besançon. I booked The Ibis Besançon Centre Ville Hotel, (through booking.com) which is perfectly located in the old city and has it’s own parking. The welcome was warm and friendly and the staff very helpful and knowledgeable with ideas about what to do in the city. The Ibis hotels in France I have found offer good clean facilites, not luxury, but certainly comfortable with all that is needed and for a city break, I wasn’t planning on spending much time in my room. We could walk everywhere in the city from the hotel. There are excellent trams and buses and also the VeloCite bicycle service works well in Besançon with many pick up and drop off points throughout the city, and many cycle lanes and routes. The bikes can be hired for €1 per day – by booking online, to receive a code or going to the Tourist Office. Read my dinner review here. Saturday breakfast was a simple croissant and coffee at The Brasserie du Commerce. A large, high ceilinged room with mirrored walls; a classic French Art Deco style interior. This place seemed popular with locals enjoying their petit déjeuner with the morning paper. We visited this place at the suggestion of Raymond Blanc too, as he used to ‘hang out’ there! We had thought of having dinner here but on this particular Saturday they were closed for a private party. Having done extensive research as to what to see and do in Besançon for a weekend, we decided to go to The Office du Tourisme for confirmation that we had the right ideas! The staff in the tourist office were really friendly and offered great guidance – nearly all of the publicity material exists in English as well as French and they spoke English too if needed. We found out that there was a Gourmands tour at 3pm that day so immediately booked ourselves onto this and left armed with maps and ideas! The Besancon Tourisme website is a mine of information with many downloadable guides and all in English, French nad German. First to the Beaux Arts covered market. What a wonderful place to discover all of the local produce in one place! There are stalls selling fruit and vegetables, local meats and charcuterie, many cheeses, wines, chocolate, honey, confiture and much more. There are a few small places to eat and drink in there too. Open six days a week Tuesday – Sunday. 7am – 7pm Tuesday – Saturday and from 8am – 1pm on a Sunday. The Astronomical clock is inside The Cathédrale Saint-Jean. This is an amazing clock to see and there is a guided tour of the clock and it’s history several times a day. These tours coincide with the chiming of the clock on the hour. The clock was designed and built between 1858 and 1860 by Auguste Lucien Vérité. It has a precise and complex mechanism consisting of over 30,000 parts and 11 movements. There are 57 faces on the clock giving a huge amount of information including calendars, times all over the world, planets, eclipses and much more. The Black Gate is a Roman triumphal arch which was built in 175 CE. It is at the southern entrance to the old city. It is amazing to see this arch which is basically intact today. Strolling through the old city we came across the 17th Century Palais Granvelle and walked through the courtyard to the Place Granvelle which is an ancient private garden given to the city and opened to the public in 1728. Sitting out on the terrace overlooking the gardens with a bandstand in surrounded by trees, we enjoyed lunch. I ate the plat du jour which was a delicious slow cooked lamb shank. We really enjoyed The Gourmand Tour organised by The Besançon Tourist Office. They organise various different walking and historical tours throughout the year. We met our guide Christelle in The Place de la Revolution for an introduction of the history of Besançon. Our tour began in The Beaux Arts covered market on the Boucherie and charcuterie stand of Katia & Sébastien Jacquet, where we tasted various different locals meats and charcuterie and were given an explanation of the making processes of the charcuterie. We enjoyed this charcuterie with a glass of delicious fresh apple juice from Alsace and chatted with the man who made it! After our salé tasting we walked around the old city where Christelle pointed out many places of interest. Showing us the different architectural styles. Walking through alleyways and down to the river front for more history of this fascinating city. We learnt that in the 19th Century, 90% of clocks in France were made in Besançon. We visited the amazing cave downstairs in Café Leffe on Rue Pasteur. We took a small detour into a local shop – La Boutique des Createurs on rue Pasteur where 5 local artisans have a permanent space for their products, including hand made jewellery in different styles, unique ceramics and a range of textiles. Then onto the sucrée part of the afternoon to Magasin Doubs Direct and an interesting and informative talk by Isabelle Blateyron from Le Criollo, who told us about the chocolates and some of the various ways they are made and created. Le Criollo is the name of this chocolate shop and is taken from the cocoa bean of the same name, which is the rarest and most expensive coa^coa bean used for chocolate making. We tasted some amazing chocolates from the region. Chocolaté can be ordered online from Le Criollo and they offer a tour of the factory on a Wednesday and Saturday at 3pm. Doubs Direct is a great shop. If you want to see all of the regional products from Franche Comte in one place, this is the shop to visit. They have a great selection of cheeses and charcuterie, wines, chocolates, souvenirs, kitchen equipment and wooden items. Situated at 6 Rue Pasteur in the pedestrian zone in the centre of the old city. Open from 9am – 7pm Monday – Saturday. And if you don’t have room in your case for all these local goodies, You can buy from their boutique online here. What a fabulous shop this is. Such an array of cheeses, local produce and wines. Once again such a friendly greeting and so interesting to hear about the various ages of Comté. We tasted different ages and settled on a delicious 42 month aged Comté which is rare as only 350 meule (of 40 kilos each) are produced annually. We also learned about the making of the speciality Cancoillotte. You can order their cheeses and other speciality products online here. This is a locally made cheese in The Franche Comte – I say cheese but it is a soft creamy runny cheese made using Metton which is produced from a hard cheese by drying it out and taking out the cream and butter. The Metton is then melted in an earthenware pot and water is added (or milk) and it is stirred for some time to form the Cancoillotte. Various flavourings are added including garlic and there are versions now using various ingredients including cumin, Savagnin wine, herbs, absinthe and mustard. This is very low fat usually around 5 – 6%. 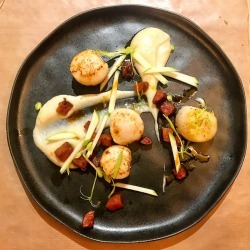 Having eaten well during the day and on the Sucrée salé tasting tour, we wanted to try the local dish Le Boîte Chaud for dinner. This is a Mont d’Or fondue in the wooden box and was served with local charcuterie, potatoes and a salad. What a delightful small restaurant downstairs in an old cave. Very friendly staff, a lively atmosphere and good local food. The Boite Chaud was delicious! This restaurant is on the Grand Rue which is easily accessible on foot in the middle of the old city. As I mentioned earlier in my post, in the city of Besançon you can hire bicycles from Vélocité. There are bicycle pick up and drop off points all over the city and having registered online and receiving our code – we could take a bike for €1 for 24 hours. We followed the cycle route around the outside of the old city along the river, through gardens and down to the Citadelle. This is a great way to explore. Our final find was the statue of Victor Hugo on Esplanade Jean Jaurès. We dropped our bikes off in front of the birthplace of Victor Hugo at 140 Grande Rue and then enjoyed an apero in the sun before lunch. Victor Hugo was born here on the first floor! I was looking for another restaurant recommendation and not that many restaurants are open on a Sunday. Well not only was Rotisserie Vauban open, at the time of writing it features No. 1 on Trip Advisor in Besançon and it was an excellent choice. Situated down at the gates to the old City under The Citadelle and close to the Birthplace of Victor Hugo we enjoyed a really good lunch and a very warm welcome. Their specialities are meats on the rotisserie and there is a large rotisserie at the back of the restaurant. They offer ‘Le Chaudron’ which is their plat du Jour and includes a café gourmand for €19.00. On this Sunday the plat du jour was a blanquette de poulet. I chose the cochon du lait and the accompaniment of lentilles au Savagnin and the entire dish was absolutely delicious. The café gourmand which followed was very tasty too. 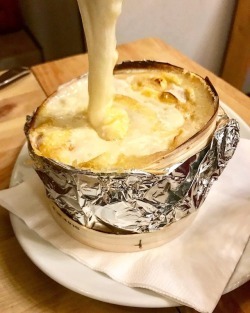 If you enjoyed this post, please enter your e-mail address below to receive an e-mail when a new post is published on Taste of Savoie. Love that you mentioned how friendly and approachable everyone in Besançon is, that’s how I have found Raymond Blanc when I’ve met him at food events. Last time I turned and fell right off a bench onto the floor at his feet (almost on them), so that was embarassing. The old fortified city looks ideal for exploring on foot. I love the sound of the Gourmands tour, and I’m a proper sucker for food markets! It is a lovely city, made better by the friendliness of all we encountered, great food and interesting Roman architecture. I so enjoyed visiting places that Raymond Blanc had been! Fancy falling at his feet!! I love the look of this place, it looks like you picked a great spot for your weekend away (and of course, Raymond Blanc pilgrimage). Will bookmark for future city breaks! Besancon looks so charming, quaint and picturesque, very picture postcard-like. I’m sure it must be a pleasure walking through the streets of this pleasant place. The Beaux Arts Covered Market looks just like my kind of place!